Interestingly, the man who designed the most recognizable American wartime recruiting poster of all time, has a thing or two to say about Love. 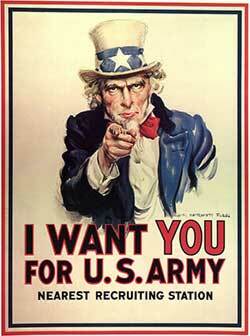 In 1917, James Montgomery Flagg created the Uncle Sam recruiting poster. He based his design on a British recruiting promotion, and some say that Flagg made himself the model for our dear old uncle. Flagg’s Uncle Sam character became so successful, that it would not only endure, but be recognized as an American icon worldwide. 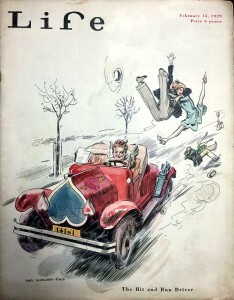 Flagg, an illustrator working during the Golden Age of Illustration, was a gifted draftsman. By the age of 14, he was a contributing artist to Life magazine. Looking through some antique magazines recently, I came across two advertisements illustrated by Flagg. Both illustrations are found in February issues, and both are geared toward an increasingly commercialized holiday known as Valentine’s Day. The two pieces are narrative in style, which is to say they capture a storyline centered around romantic relationships. The first is a piece for Elgin Jewelry. It was published in an issue of National Geographic in February of 1926 (v.49 no. 2). 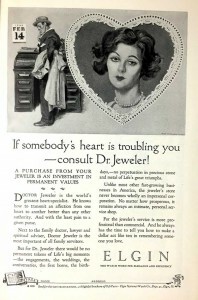 It depicts a man pondering how he might make a woman with a “troubled heart” happy once more. She certainly does look unhappy in the illustration. This composition is effective, I think. The illustration gives us a snippet into a relationship, and we see a man who seems to be sincerely thinking about the best possible gift. I find myself pulling for him, hoping it works out! This illustration is great. Here are innocent people walking along the street when Cupid, driving his love-mobile, hits them and figuratively upends their lives. Flagg has creatively given the car’s hood and headlights the shape of hearts. But the part I really love is in his technique—the hatch lines he uses for shading and contour. This is classic age-of-illustration stuff. The evenly spaced hatch marks used on the car and in the shadow beneath the car contrast nicely with the more organic lines that swirl about the speeding car and upended couples. This is an awesome piece of illustration. There is so much movement here—the diagonal composition, the line work that leads from the red car as focal point to the couples flipping through the air. I’ve always admired James Montgomery Flagg and his contemporaries. This piece is a good example of why: Flagg has given us a whimsical scene, and we know instantly what is happening here. But if we take the time to look, there is also enough complexity to hold our interest. Solid technique is the basis for a great illustration. We are given more than just lines and painted shapes. Flagg’s work reminds us that love can also feel corny, and that’s okay.